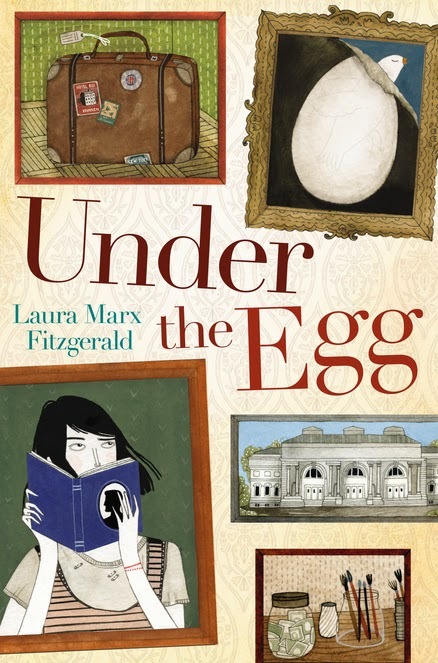 I am kicking off the fifth week of summer break with author Laura Marx Fitzgerald. We chatted about Under the Egg, art history, New York City, Who Wants to be a Millionaire?, and Kate DiCamillo. What planted the seed for Under the Egg? Laura Marx Fitzgerald: In 2009, there was an economic crash, I had a new baby, and between the two I didn’t have much attention left for complex literature. I started re-reading the Little House series and was struck by the family’s unflagging pioneer spirit. I wondered what that spirit would look like in the middle of glittering, gentrified Manhattan, and Theo was born. The easiest test of an old master—and the one test almost certain to be carried out—is to dab the surface with rubbing alcohol. In a genuinely old painting, the surface will be hard, and the alcohol will have no effect. If the painting is new, the alcohol will dissolve a bit of paint, and the tester’s cotton swab will come up smudged with color. This set off a series of possibilities: What if someone painted over an old oil painting deliberately, with the intention of later removing that top layer of paint? Why would someone do that? To hide or smuggle out a painting certainly, but could there be a noble reason behind it? These questions led me to Jack. I introduced him to Theo, and the rest is Under the Egg. How did your background in art history help you write Under the Egg? Laura Marx Fitzgerald: The study of art history for me was a study in boredom. My professors delighted in lecturing on whether the thumb in Artist X’s painting was inspired by the thumb in Artist’s Y’s painting, and let’s compare those thumbs for the next hour, shall we? I left my degree behind and plunged into the least academic career I could think of: advertising. But I couldn’t stay away from New York’s great museums, and unlike my relieved departure from darkened lecture halls, I always left a museum feeling excited and inspired—because, I realized, I left with my head full of stories. As I thought about it, I saw that these were always stories about people: the people who created the art, the people in the art, the great gods, heroes, myths, and legends depicted there. Those stories reignited my interest in art history. Explore Theo's New York City. New York City feels like a character in Under the Egg. Please share three must-see spots in Theodora Tenpenny’s neighborhood. Laura Marx Fitzgerald: Theo’s favorite library is one of mine too. Most people think the Jefferson Market Library is a converted church, but it was actually once a courthouse and jail. (The Reference Room occupies what were once the holding cells, and the former police court is now the spectacular Children’s Room.) Once a year, as part of the city’s Open House Weekend program, you can climb the 149 steps to the top of the clock tower. While technically part of the Jefferson Market Library, the garden behind it feels like an entirely different space to me. There is something about the space that feels entirely removed from the city around it, and it’s where I first got the idea of a lush, living garden in the heart of the Village. The garden holds a special place in my heart; my son was in the NICU at the now-defunct St. Vincent’s Hospital a few blocks away, and I would come here daily to eat lunch, reflect, and recharge. No matter what time of year—although summer draws the biggest crowds and most competitive play—I love to stop and watch the pick-up basketball games at Waverly Place. In ten minutes, you’ll get more trash talking and muscle flexing than an NBA game (and no commercials). I’m sure Theo would have loved the games, and in retrospect, I’m not sure why I didn’t include them in the book! Listen to Kate's picks for summer treehouse reading. Kate DiCamillo gave Under the Egg a rave review on NPR. Tell us about one of your favorite books by the one and only Kate DiCamillo. Laura Marx Fitzgerald: While I am partial to The Tale of Despereaux, the Kate DiCamillo book that will always hold a special place in my heart is The Miraculous Journey of Edward Tulane. I’ll never forget the lazy summer afternoon when I discovered my daughter on her bed, sobbing over the ending. She will always remember that book as the first one that brought her to tears. I will too. *Reading is my first true love. *Mr. Schu, you should have asked me if I’ve ever been on a game show. I have, now that you mention it! I was on Who Wants to Be a Millionaire—and so was my husband! I can’t even remember the outcome, only that one of us won four times as much as the other . . . Borrow Under the Egg from your school or public library. Whenever possible, please support independent bookshops. I love this book and have been recommending it to many!